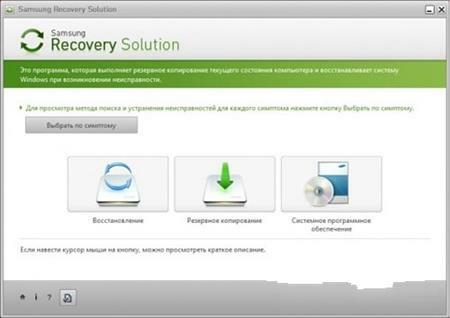 Samsung Recovery Solution is an essential application for the users that own a Samsung laptop and need to restore its hard disk and operating system to a previously backed up version. The program can be used to retrieve important files and settings in case of a virus attack or malfunction. The application can only be used on Samsung hardware since it requires access to the Samsung Recovery Area so that it can be installed on your computer. This area refers to a hidden hard disk partition that stores the backup files and that cannot be recreated if you formatted the hard drive. The purpose of the program is to bring back a previous computer configuration that allows you to use its programs or to read certain files that have been deleted by accident. In order to perform this operation, you need to create periodical backups for your important files or for the entire hard drive. A partial backup can be created by selecting the files that are important and need to be protected from deletion or virus attacks. When you need to repair the system you can choose to restore all the backed up files or to select the files that you want to retrieve from a specified data backup. The Complete Restore feature can be used to roll back all the changes made to the computer after a certain backup. This operation deletes all the current files, the programs, and the system settings in order to restore the computer to the exact backup state. If you want to perform a clean install, this feature can save you time by restoring the hard drive to the Computer Initial Status. This provides you with a fresh operating system within a few minutes and with minimum effort. Samsung Recovery Solution can be useful both for the corporate users that need to protect business-related data files from a system crash and for the private individuals that want to recover their personal files with minimum effort.